The software I use is the brilliant Scrivener – it’s so writer-friendly. I have no affiliation with the company, but I have a lot of love for it! Scrivener is such a customisable piece of software. I would venture it suits all kind of approaches to writing. For me, it’s works so well for many reasons, but mainly because I can see to the left of the page I’m writing on, not only an entire list of my numbered chapters, but also the titles of individual scenes. So, taking an example from Killing Ways again, I might have a list of chapters one to ten, separate files, one underneath the other, then below that, five individual – titled – scenes that I know have to fit into one of the first ten chapters. Say, I’ve written a scene with the title “Ren & Everett in club, hammered” – it’s right there, very easy to go into, cut, then paste into whatever chapter I feel it needs to be in. 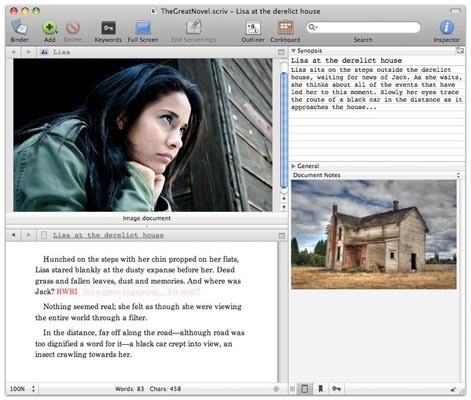 Available for both Mac and Windows, Scrivener is a powerful content-generation tool for writers that allows you to concentrate on composing and structuring long and difficult documents. While it gives you complete control of the formatting, its focus is on helping you get to the end of that awkward first draft. Writing a novel, research paper, script or any long-form text involves more than hammering away at the keys until you’re done. Collecting research, ordering fragmented ideas, shuffling index cards in search of that elusive structure—most writing software is fired up only after much of the hard work is over. But Scrivener is invaluable from the word go: a word processor and project management tool that stays with you from that first, unformed idea all the way through to the final draft. Outline and structure your ideas, take notes, view research alongside your writing and compose the constituent pieces of your text in isolation or in context. Scrivener won’t tell you how to write—it just makes all the tools you have scattered around your desk available in one application. Scrivener puts everything you need for structuring, writing and editing long documents in easy reach. On the left of the window, the “binder” allows you to navigate between the different parts of your manuscript, your notes, and research materials, with ease. Break your text into pieces as small or large as you want—so you aren’t wrestling with one long document. Restructuring your draft is as simple as drag and drop. Select a single document to edit a section of your manuscript in isolation, or use “Scrivenings” mode to work on multiple sections as though they were one: Scrivener makes it easy to switch between focusing on the details and stepping back to get a wider view of your composition. 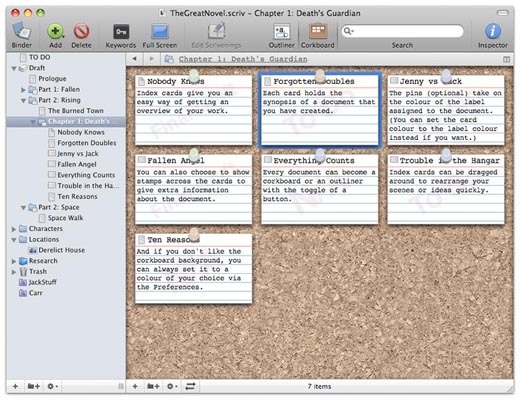 Scrivener lets you work in any order you want and gives you tools for planning and restructuring your writing. You can enter a synopsis for each document on a virtual index card and then stack and shuffle the cards in the corkboard (above) until you find the most effective sequence. Plan out your work in Scrivener’s outliner and use the synopses you create as prompts while you write. Or just get everything down into a first draft and break it apart later for rearrangement on the outliner or corkboard. You can create collections of documents to read and edit related text without affecting its place in the overall draft; label and track connected documents or mark what still needs to be done. Whether you like to plan everything in advance or write first and structure later—or do a bit of both—this software is extremely versatile. With access to a powerful underlying text engine, you can add tables, bullet points, images and mark up your text with comments and footnotes. Format as you go using the format bar at the top of the page, or use any font you want for the writing and let Scrivener reformat your manuscript after you’re done—allowing you to concentrate on the words rather than their presentation. Scrivener provides all the tools you need to prepare your manuscript for submission or self-publishing. Once you’re ready to go, control everything from how footnotes, headers and footers appear to fine-tuning the formatting of each level of your draft—or keep it simple by choosing from one of the Scrivener’s presets. You can print your novel using standard manuscript formatting or export your finished document to a wide variety of file formats, including Microsoft Word, RTF, PDF and HTML. You can also self-publish by exporting to ePub or Kindle* (requires KindleGen) formats to share your work via iBooks or Amazon, or for reading on any e-reader. Get your version of Scrivener by clicking the link below – if you are an Emerging Writer, Author or Orgnisation Member of Writing.ie, drop me a line (vanessa@writing.ie) for a 20% discount code. We will soon be introducing a Members perks section to Writing.ie and this will be one of the first!